As a current or aspiring medical assistant, you may be one of the last people patients see on the way out of the hospital, clinic, doctor’s office or other healthcare facility where you work. For this reason, it’s of the utmost importance to ensure that your patients understand their medications, treatment regimen and other components of their health. Below, Prism Career Institute outlines a few ways you can better communicate with your patients. If you told a patient that they were febrile, odds are that they would have no idea what you meant. But if you said that they were running a fever, they’d likely understand exactly what you were talking about. Part of effective communication as a medical assistant means putting complex medical jargon into layman’s terms. Most patients have an understanding of basic medical terminology, some have more and some have less. 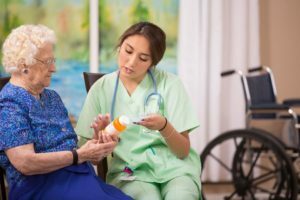 Providing information about medications and health instructions in plain language helps ensure the best ongoing care for all patients. Going hand in hand with eliminating jargon, simplifying medical information helps ensure that patients adhere to treatment guidelines. For instance, one of the top reasons why patients are reluctant to take their medicine is a lack of understanding. They may think that the medication isn’t important or that the potential side effects outweigh the benefits. Clearly communicating what the medication is and why it’s important for them to take it can help make sure they adhere to their doctor’s treatment plan. Just remember: give enough information when interacting with patients, but not too much. It’s always a good idea to encourage questions as well, and provide clarification with patience when required. For medical assistants, helping others is just a part of the job. If you’re looking to enter this rewarding field, get the education you need at Prism Career Institute. Our Medical Assistant Training program, which is available at our Egg Harbor and Cherry Hill, New Jersey locations, provides career-focused training that prepares you for entry-level jobs in the healthcare field. To learn more, contact an admissions representative today at 1-888-966-8146.